Welcome to the Summer recreation program! 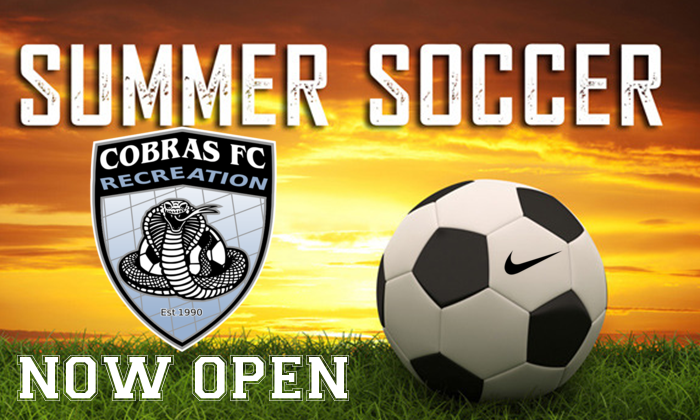 Cobras FC Recreational clinic will be included FREE of charge with your player registration. Fantastic coaches who help deliver a fun experience for your kids! Lil Cobras and U6 will be the only Coed bracket. U8-U19 will have separate boys and girls teams. 1.) Boys U10, U13, U16 & U19 - play Monday & Wednesday evenings. Practice schedules TBD by coach. 2.) Girls U10, U13, U16 & U19 - play Tuesday & Thursday evenings. Practice schedules TBD by coach. 1.) Boys U8 - play Monday & Wednesday evenings. Practice schedules TBD by coach. 2.) Girls U8 - play Tuesday & Thursday evenings. Practice schedules TBD by coach. 3.) Coed Lil Cobras U4 & U6 - play Tuesday & Thursday evenings. Practice is same day as game. The MURSL program for ages u10 -u19 where kids play against other towns in monroe county. The in house program is for Lil Cobras - u8 where kids play against other recreational Cobra teams. Each team will have 10-12 games depending on age. If you are interested in having your son or daughter’s friend play youth soccer together, make sure their parent also sign’s up and mark it on the registration sheet. We will try and honor these requests, but can’t guarantee placement.